You are leading a team of naturalists on the mysterious island of La Isla. The island is so mysterious that, apparently, it is named after itself. What is truly mysterious though is that a whole host of rare animals thought to be extinct have found refuge on this tiny island. Rather than leave well enough alone, your goal is to locate and capture as many as possible in order to win the prestige of the scientific community, the wonderment of the world, and the adoration of your daughter who desperately wants a pet dodo bird. Who’s gonna miss just one? Lets assemble an island! The circular board is modular and you will put together the 10 peripheral pieces of the island around a center piece. Then place an animal token randomly on every empty green area on the island. These areas are surrounded with numbers (2,3, or 4) which are associated with the number of colored areas with different icons (hats, knapsacks, tents, canteens…). The purpose of the game is to capture animals by surrounding them with your explorers. When each colored area surrounding an animal contains one of your explorers, you successfully capture that animal. Getting explorers on the island is a bit trickier. Each round, the players will all take three cards. The cards each have three potential uses — the top of the card provides a special action, the lower left provides a resource, and the lower right provides an animal. The cards are then added, face down, below the A, B, and D spaces of their cardholder. Placement depends on what aspect of the card you wish to be used. The card actions are then done simultaneously. a) This allows you to use the special action on the top of the card. Each player can have three special actions at any one time. If there is an open slot, then the card in A goes there. If there is no open slot, then the card has to cover another card to become active. 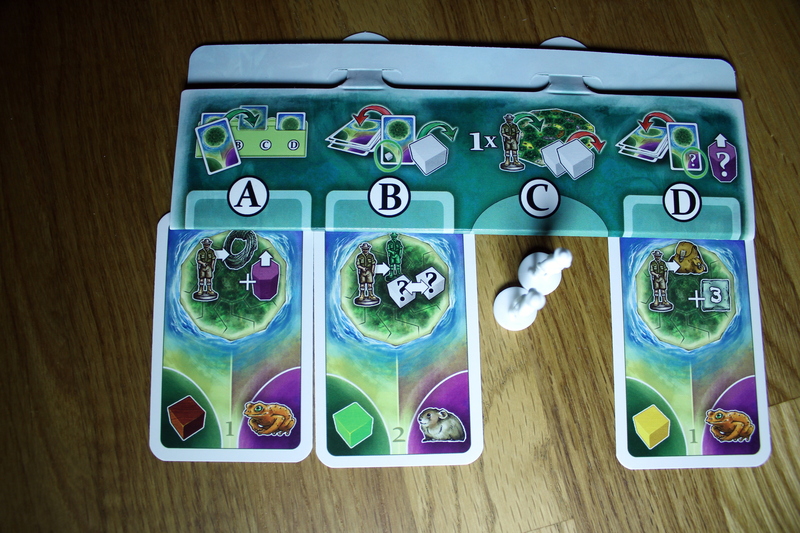 b) The card in B is using the resource and the card is discarded and the player can take one resource as shown on the card. c) No card in slot C! Everyone, in turn order, may place one explorer on the island or take a resource from the supply. Explorers are placed on the colored areas on the island and a space can be occupied by more than one explorers (science is friendly that way…). If a player is out of explorers then they may move one already on the island. There is a cost though! Players need to pay two resources of the same color as the space. If a player successfully surrounded an animal then remove the token and the player scores (2, 3, or 4) points. d) The card in D is using the animal icon. The card is discarded and the animal’s purple marker is moved up one space on the game board. The player then scores points for each of the animals they have captured. 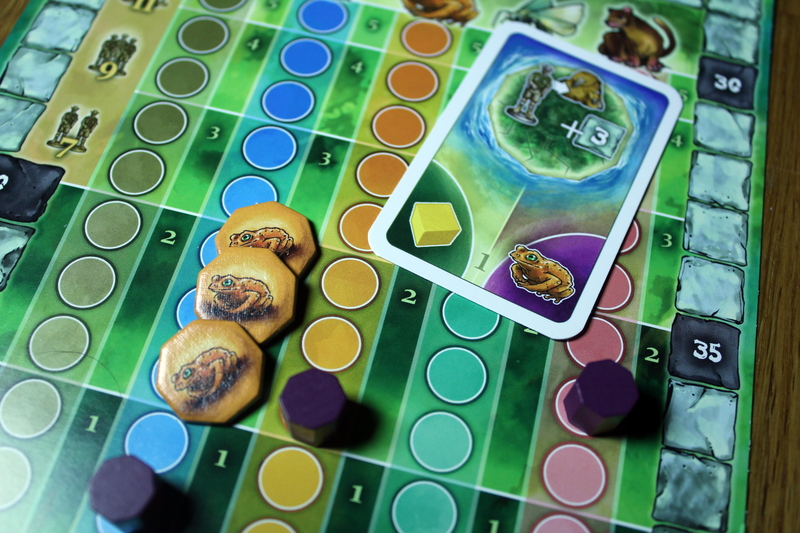 This play continues until, depending on the number of players, a combined value of animals on the game board is met. Then score an additional ten points for each complete set of animals and apply the appropriate multiplier for each animal and one point for each remaining resource cube. For a Feld design, this is a light game. It is simple to explain and set up and the rules are quickly understood. All this without horribly limiting your decisions in the game. There are quite a few. I especially like when cards have multiple uses so the tactical element of this game is increased. Players need to determine the most optimal play of the cards they have. Which special abilities to keep (or cover up), which resources to grab, and what animal to move up in scoring. But not too much. You never feel overwhelmed with the amount of choices. The strategic element will appeal to experienced players. The tactical to new ones. I tend to prefer tactical games but the strategic elements of Las Isla didn’t kill me. 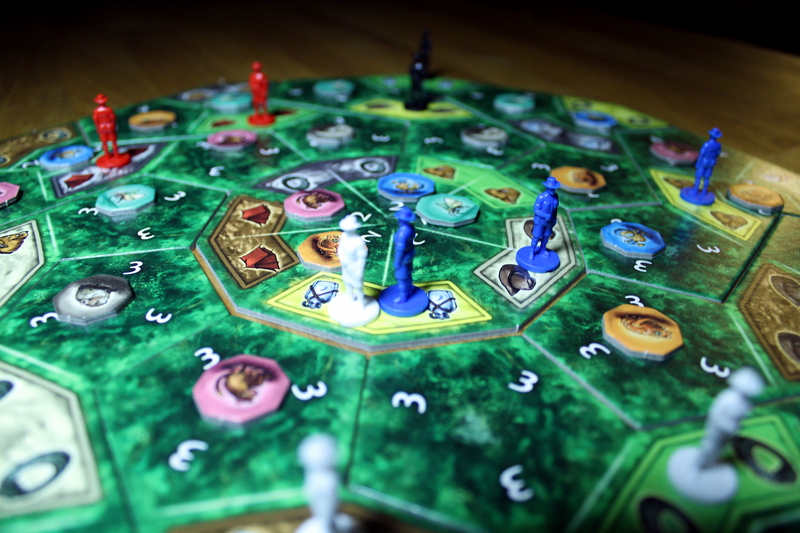 The placement of the explorers on the board. Which to move. Anticipating which areas are going to be of interest to the other players. All this provides a nice approachable strategic environment. I love a good “inspansion.” La Isla allows for extra cards for the experienced gamer versus a simple, base set for a beginner. But basically, if you have ever played a modern board game or a game designed by Feld, include the cards. Playing with newcomers, keep them out of the first game or two. There isn’t much player interaction. However, with the jockeying around for position on the board and the ability to snag an animal from other players. For a family game, there is a pleasant amount of interaction but I wanted a bit more. The ability to block other players from spots on the island would have been more my speed. The game lends itself to be more of an optimization game. Which is fine if that is your thing. No judgment here. The components are lacking. The card holders are flimsy and I doubt that they would stand up to the use you would expect in a library. The plastic explorer minis were not that compelling and I ended up replaced mine with standard wooden meeples.